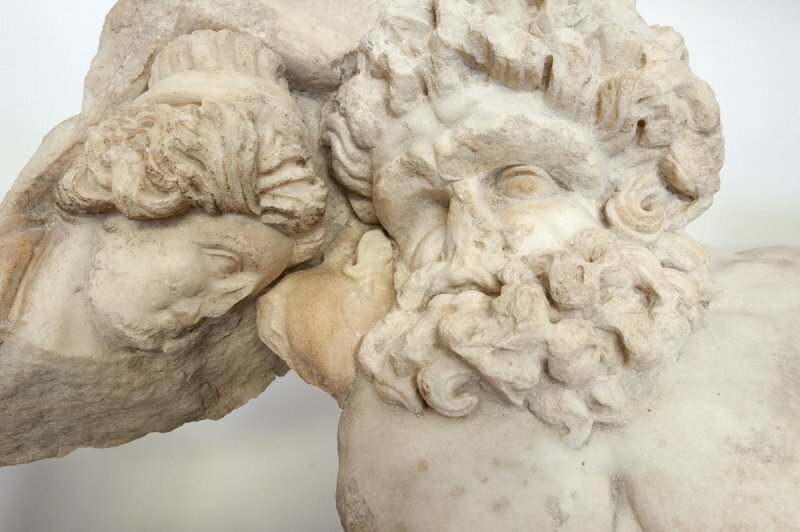 Polyphemos and Galatea. Wikipedia: Polyphemus (Greek: Πολύφημος, Polyphēmos) is the gigantic one-eyed son of Poseidon and Thoosa in Greek mythology, one of the Cyclopes. His name means "everywhere famous". [...]In Homer's Odyssey (Book 9), Odysseus lands on the Island of the Cyclopes during his journey home from the Trojan War. He then takes twelve men and sets out to find supplies. The Greeks find and enter a large cave, which is the home of the great Cyclops Polyphemus. When Polyphemus returns home with his flocks and finds Odysseus and his men, he blocks the cave entrance with a great stone, trapping the remaining Greeks inside. The Cyclops then crushes and immediately devours two of his men for his meal. In the morning, he kills and eats two more. It is said that "rapping them on the ground, he knocked them dead like pups". [And so forth. But:] The Hellenistic poet Theocritus painted a more sympathetic picture of Polyphemus. The Cyclops of the Odyssey has been recast in the poet's pastoral style which idealized the simple lives of shepherds. In Idylls 6 and 11, Polyphemus becomes a gentle shepherd in love with the sea-nymph Galatea, finding solace in song.